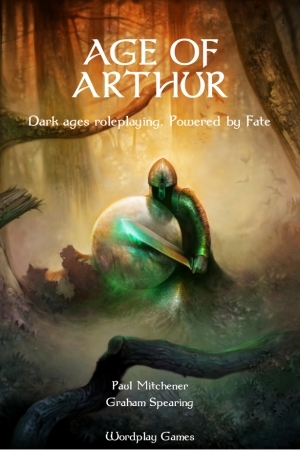 In this blog post I want to talk about my one self-published project, Age of Arthur. I say self-published, but for this one I had a coauthor. We both fell for the Fate system, and after a game of Diaspora we played together in (well, technically, I ran it and Graham Spearing was one of the players, but you know what I mean), we both had an urge to write a Fate-based game. We had similar likes and dislikes for what would work, so we started working together. Then Graham had the idea for an Arthurian setting with a more dark ages feel than Pendragon (we both loved Bernard Cornwell’s Warlord Chronicles trilogy), and I did lots of research, our friend Andy Sangar put together an Arthurian timeline, and we both did lots of writing. I don’t want to write about the writing and research process, interesting though it was at the time. I want to write about the extra stuff that was involved aside from just writing the thing involved in bringing the game to print. At various stages in the draft, we each ran a few one-shots using the system, including one that became the scenario in the main book. I also ran a campaign, which let me see for the first time how other people reacted to character generation. I didn’t change the rules during play- that sort of thing tends to derail games, but I did get lots of ideas for tweaks afterwards. When the tweaks were made, we did some serious self-editing, before contacting an artist, Jason Behnke and map maker, Steff Worthington. Steff came up with a lovely map of dark ages Britain, and, with his friend Genevieve Fournier, gave us some handy feedback on the Gazetteer, which was duly incorporated. And Jason’s art when it came was absolutely beautiful, going a long way to defining the look of the book. It was the quality of the art that led to the decision to make a full colour version available. The art consists of a covers and a full page spread in between each chapter. We then asked for playtesters (thanks to our lead playtesters, Neil Gow of Omnihedron Games, and Ben Quant), Graham set up a website, and I started promoting by chatting about the game on forums. I started a thread on the ads/promos section of rpg.net, which I seeded with occasional updates, and UK Role Players was good enough to host a forum for the game. Graham set up a page on Google+. This all generated some initial interest which was good. The playtest feedback was appropriate robust, with comments pointing out that some rules were just plain not working or broken. Others were unclearly written. So we made more changes- that’s what playtesting is for. In particular, Neil really helped us tighten things up. Then we were nearly done, right? Ha ha ha ha ha. More self-editing. Then an external editor. Mitch Williams volounteered for this noble task, and he helped us clarify many more points in the text where the rules were unclear, and what I thought was a surprising number of little typos and grammatical mistakes. This surprised me- we’d self-edited, and I thought I wrote good anyway. It was embarrassing to find that there were places where I’d done things such as writing “viscous” instead of “vicious”. He’s someone else who went well beyond the call of duty in helping us out. Oh, and layout. We’d had various ideas, but over time I came to realise I wanted to do layout myself. I knew what I wanted in terms of hyperlinks, bookmarks and index, and I knew that I didn’t trust anyone else to do the job. Lots of work in life is made with that philosophy. Incidentally, by the time I’d started the layout, the initial date I’d mentioned for release of the game had already passed. Whee! There’s a moral there. So, more layout, which was a fiddly technical job, and more comments from the editor, with bonus layout glitches to spot. More posts on forums as we started getting the lovely finalised art pieces. I also set up a Facebook page to show a bit more off. More interest from people, with a hint of impatience. More helpful advice from Tim Gray of Silver Branch Games, and Neil Gow. Eventually, six months after the initial planned release, the PDF was ready to go. I uploaded it to Drivethrurpg to test it out, and a few hours later realised it was actually on the front page, had generated some interest and sales, and was out there in the world. We’d done one other thing I thought was rather clever at the time, promising a discount equal to the value of the PDF to any early adopters for the print version when it came out. More on that later. Ah, print. That took another couple of months to sort out. Why? Well, the first few attempts at uploading a print file were turned down- my margins were wrong. Then we got the first proof back, and there were two problems. The first problem was an example of my ridiculous stupidity- the covers were the wrong way round. The front cover was on the back, and the back on the front. Remember when I said I wouldn’t trust anyone else with the layout? That seemed laughable. The other, worse, problem was that we’d used the printer’s standard colour for the physical book. For what we wanted, standard colour wasn’t good enough. Pages didn’t bleed to the edges, leaving white margins, and worse, the beautiful artwork, which is rather rich and varied in colour, had all life leeched out of it. The book did not look good. This led to the decision to bring the book out in premium colour, but premium colour is rather expensive, so we did a cheaper black and white version. After a couple of comments, we also decided to go for both hardback and softback options. I hadn’t initially planned hardback, but I’m really glad we went for it in the end. In the first black and white proof, the tone was out on one of the pictures, but the second proof was fine. Wahey, a book for release! As for the premium colour, the first proof looked breathtaking gorgeous, with a lovely hardback cover, and high quality paper, but the margins were out, leaving white space. Fortunately, the second proof was as we wanted it- and the thicker pages made it look soooo much better than the standard colour version. I was able to wrap up the second proof and take it to Graham Spearing’s birthday party- it had arrived the day before. So the physical books were released, and discount codes were sent to those who’d bought the PDF. Our travails were, unfortunately, still not over- not every PDF buyer had received the codes. Plenty had settings on Drivethrurpg blocking e-mails from publishers. Incidentally, logging into Drivethrurpg through Facebook sets up such a block automatically. Fortunately, that was solvable by a quick e-mail with the codes for those who got in touch. I hope I’ll make fewer mistakes next time I self-publish something. I haven’t even catalogued every single error made. I’m glad I did the self-publishing thing. It was hard work. I wouldn’t have managed if it hadn’t been a joint endeavour with Graham, and we hadn’t had advice and help from those mentioned here. One day I’ll self-publish another project. But not yet!